Lately my days have been busy as I'm back to work after a long recovery from a major foot injury. However I have managed to get some cooking time squeezed in. For example, this Tortellini Alfredo was a dish I whipped up in less than 20 minutes... so cooking is still possible despite a busy schedule. So if I'm able to get a meal on the table with minimal time, I'm sure others can too! This recipe is really all about the alfredo sauce. Forget the prepared jars of sauce at the store... it's just as easy to make a good alfredo sauce from scratch. You can pair it with any pasta and/or vegetable of your choice because in my book, alfredo sauce makes things taste better. 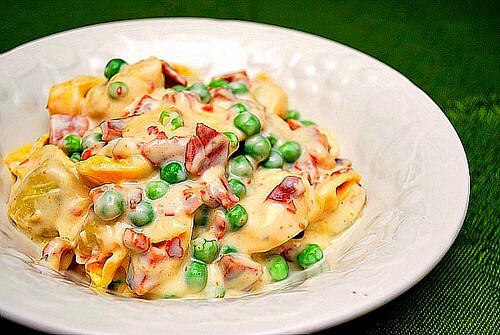 In this case, I tossed the alfredo sauce with cheese tortellini, peas and some bacon. Add water, salt and tortellini pasta to the IP. When the IP beeps after pressure cooking for 3 minutes, urn the setting on top of your IP to VENTING. Doing so allows the IP to quickly release any remaining pressure (also known as QPR or QR). I use a wooden spoon to carefully turn the setting to avoid close contact with the potential steam. You may also want to turn your IP away from cabinets to allow the released steam to escape freely. The pin at the top of your IP will drop when all pressure has been released and it's safe to open. Press SAUTE and add heavy cream, butter, Parmigiano-Reggiano, pepper and nutmeg; bring to a boil to thicken the sauce. Add the peas and bacon; cooking until warmed through, serve immediately.